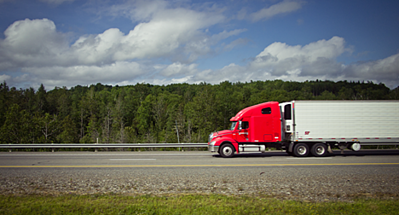 Want to Improve Truck Driver Retention? Hire Better. Poor truck driver retention can have a crippling financial impact on fleet owners, who lose money every day a truck sits idle. Too often the response to this dilemma is to fill these empty seats as fast as possible through aggressive recruitment and incentives. Wrong! Though it may seem counter-intuitive, fleet owners need to slow down the hiring process to maximize driver retention. First, let’s look at the numbers. A study by the Upper Great Plains Transportation Institute found that the average cost of driver turnover is $8,234 per driver, including lost productivity, lost revenue, advertising, recruiting staff, training, sign-on bonuses and other elements. We think that number is conservative since lost revenue alone can cost carriers $1,000 a day, as expensive equipment sits idle. And the numbers don’t even address the potential impact on product sales if deliveries are missed or delayed. When faced with driver shortages created by turnover, most fleet owners crank up recruiting efforts, offering driver jobs to anyone with a CDL. But that’s like investing in better ways to bail water out of a leaky boat. Fix the leak! Even fleet owners who do stress retention have it wrong. They often focus on paying quickly and accurately, offering more home time, and deploying good, reliable equipment. All important stuff, but those efforts focus solely on keeping drivers after they are hired. Success in driver retention has more to do with what happens BEFORE the driver is hired than after. Once KANE’s Freight Solutions team recognized this irony, our retention numbers have improved drastically. 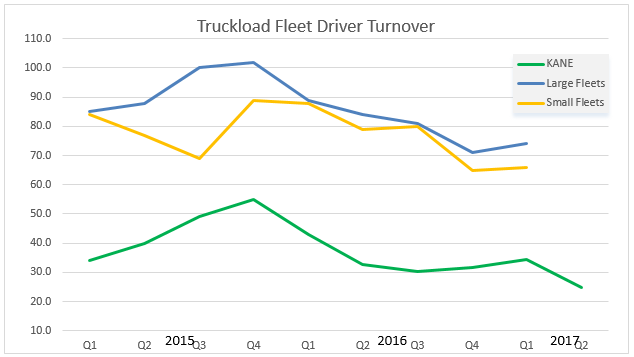 As the chart below shows, KANE’s annualized driver turnover rate is 25%, compared to the 74% churn at other large fleet operators. We achieved these results, in part, because we doubled down on our investment of time and effort during the hiring process. The logic: By making sure we hire the right people in the first place, we would drastically reduce the cost to the company of driver turnover. We have a full-time recruiter in the transportation group (not HR) who does a thorough pre-screen. If the driver makes it through this initial screen, our operations manager interviews the candidate, explains the job and assesses the candidate for professional and cultural fit. The Safety team then interviews the driver and does a deep dive into CSA scores and the background on any past accidents. Keep safety first is the top item on the KANE Code, so this is a key area of emphasis. If the recruiter, operations manager and safety team ALL agree to move forward, KANE’s Shop Team does a full road test with the driver. A driver’s demeanor can be very different behind the wheel, so at this stage we are assessing not only driving ability but their attitude toward safety, truck maintenance and how they might handle difficult situations. If the driver passes the test, an offer is made. If it is accepted, we do a physical and drug screen. This hiring process is more time-consuming and more expensive than that of most logistics companies, but the ROI is dramatic when you consider the cost of higher turnover levels. Over the years, we have identified certain keys to our success in driver retention. They tend to conflict somewhat with what we observe is common industry practice in the competition for drivers. Be honest. Most driver recruiters, eager to fill seats, paint the best picture possible about the job. Actually, it may be better to give a worst-case scenario. For instance, even if they would be driving a day cab and would sleep at home 99.5% of the time, we tell drivers this is not guaranteed. We want to make sure they are OK with this and that there are no surprises. With any aspect of the job, you never want to be in a position where the driver says, “But you told me….” Most drivers appreciate a high level of honesty and transparency. Do a thorough orientation. Sure it’s tempting to fill a seat and get a truck back on the road. But the first few weeks of a driver’s tenure can make or break their experience. Don’t rush the orientation process, as many do. New drivers who feel ill-prepared for their route or who struggle with paperwork and other process requirements will get frustrated. At KANE, we do an extended orientation on company policies and then send new drivers out with our most experienced drivers for a full week. During this week, new drivers get to see how things work, pressure-free, and ask questions to gain a full understanding. Fleet owners can see a huge financial gain from improved driver retention, but don’t dismiss the benefits for shippers who hire common carriers. Shippers love the continuity and reliable capacity of a stable carrier driver force. They see the positive impact that experienced drivers have on their performance metrics. They appreciate how a driver’s knowledge of their receiving process can speed turnaround time. And, often, they come to view drivers as part of their own teams, getting to know them on a first-name basis and relying on them as the backbone of an efficient distribution process. Whether you’re a fleet owner or a retailer or manufacturer who relies on carriers to perform, a stable driver force is critical to financial performance and great service. But success in truck driver retention is not about what happens after the driver is hired. It’s about making sure the right people are hired in the first place.